Nothing like a deadline to get stuff finished, right? Every year our quilt group makes 80 or so Christmas stockings for the local Ronald MacDonald house. I never make very many, and this year what with being gone, I only managed this one which I finished yesterday. I had promised to have it done by today's meeting. Whew! 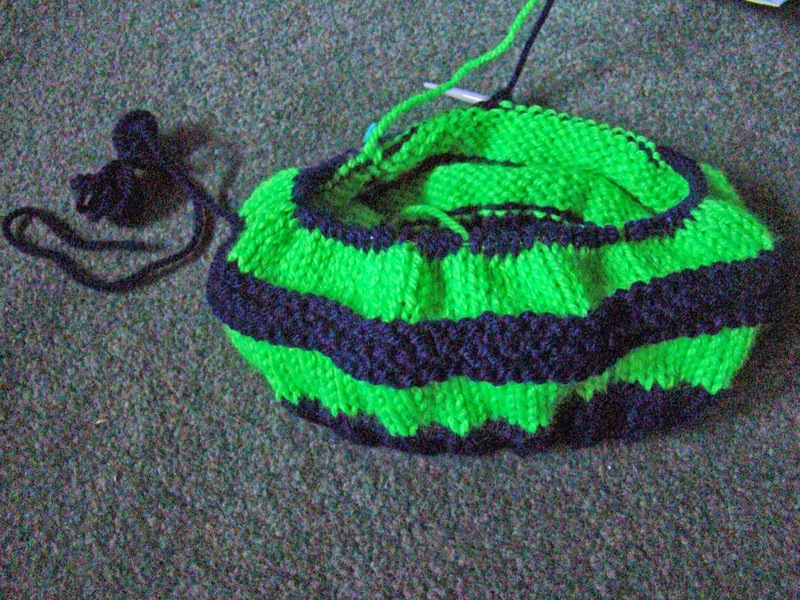 And I'm knitting away on a hat for Max in Seahawk colors. Go Hawks! See what others have been doing at Patchwork Times. Love your stocking and the hat will be so nice when finished...I don't know the team, but I do like the colors. I don't like crafting deadlines, as it takes the fun out of creating. What am adorable stocking. I love the little snowmen. Love the stocking, Judy, especially the fabric on the back side. 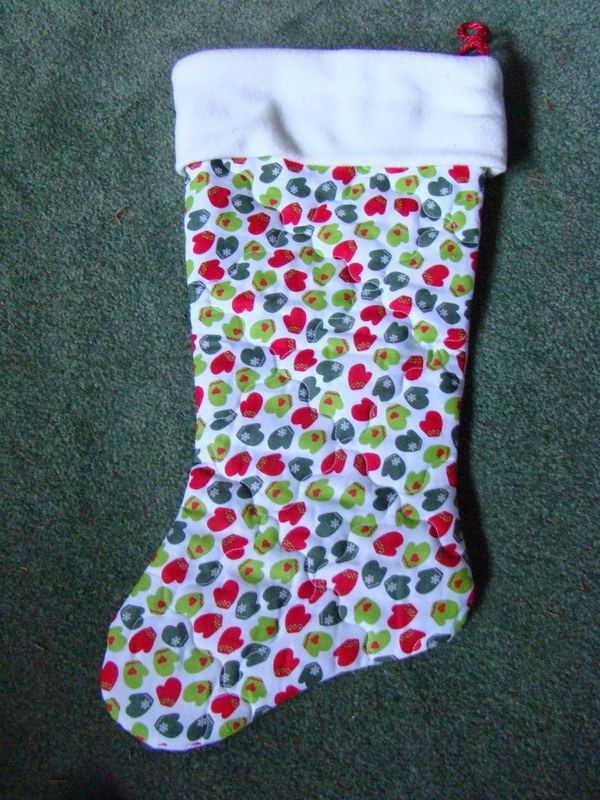 What an adorable stocking! Good job. Hi Judy, seems like ages since I have visited your blog. Can't wait to see what you have been up to. Great stocking and what a wonderful donation idea. Your stocking is so cute. Cute stocking. My daughter would love the Sea Hawks hat. I did not receive an email to answer your question on my blog. The pattern for my socks is "Sailor's Delight" from "2-at-a-time Socks." It's a fun one to knit! 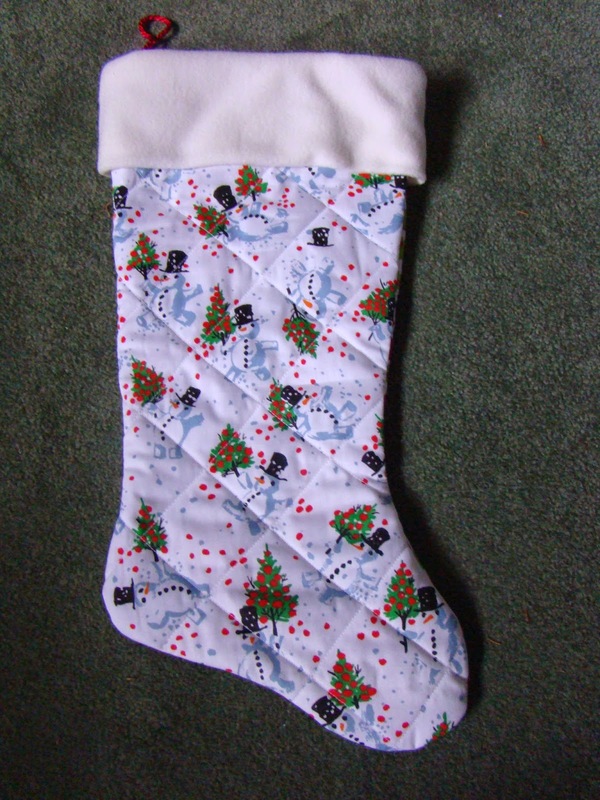 Nice idea, a two-sided stocking. Sometimes I think I do my best work under a deadline, even though I hate the stress of it. I think that's the only reason I got my last quilt finished! Did you see the eyeballs to knit on KnitPicks.com? Maybe the kid would have fun with those! The stocking is wonderful, but the hat would look better in Packer colors! Stocking are so fun to make arent't they? Quick and easy - and especially nice to make for those less fortunate - it's fun to think of their eyes lighting up when they get them filled with goodies! Very cute stocking. I know I should do some charity knitting!